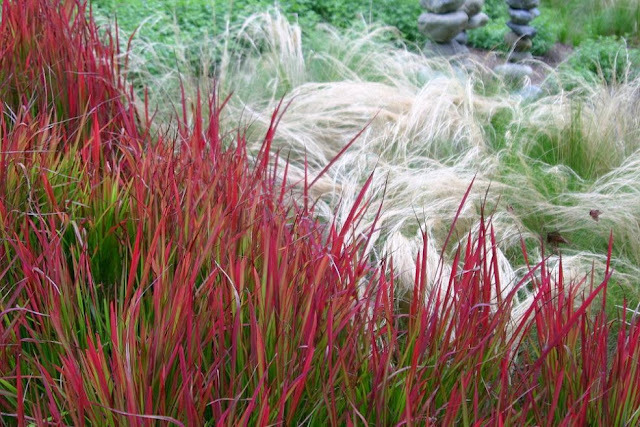 Ornamental grasses have both structure and grace, and there are a huge number to choose from. However, they do have one major drawback, and that is they do lack the colour of more traditional foliage plants. At least that is true save for one example, the stunning Imperata cylindrica 'Red baron'- the Japanese Bloodgrass. This unique perennial grass is a native to east and southeast Asia, India, Micronesia, Melanesia, Australia, and eastern and southern Africa. 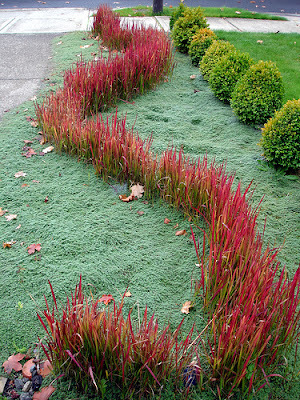 As exotic as it is, the Japanese Blood grass is hardy enough to be grown in the warmer regions of northern Europe. And while it is solely grown in the west for ornamental purposes, the less colourful species is used for paper-making, thatching, weaving into mats and bags, thatching the roofs of traditional homes throughout south-east Asia. It is also used in traditional Chinese medicine. It develops its brightest blood-red colouring when grown in full sun and is best seen where the sun is behind it. It will remains attractive until late autumn until it goes dormant in the winter. While the young flowering shoots are edible, the Japanese Bloodgrass will rarely flower in the cooler climates of northern Europe. The Japanese Blood grass is best grown in damp and very humus rich soil that will remain moist throughout in summer. If it is grown in soil that is kept too dry then it has a habit of slowly fading away. The clumps spread slowly by underground by means of runners. Cut back to ground in early spring to expose more of the new seasons foliage.